Often used to refer to hexagonal shapes or designs, this term also refers to a type of storage that is naturally created by honey bees for their use during winter months when their supply of fresh flowers are not available. Built vertically and horizontally, each unit or floor of a two section (floors) Honeycomb contains individual wax compartments where the honey is stored in the six sided wax tubes. The sets of tubes for each floor are slightly offset from the tubes above so that each floor serves as a separate storage section where honey can be deposited and stored without draining through and out the bottom of the Honeycomb. Honey removed from the Honeycomb is referred to as "comb" honey and is most often considered as the purest form of honey as it remains in its natural state. If the honey is to be processed, the Honeycomb is removed and then placed in a machine that uses centrifugal force to separate the honey from the comb. 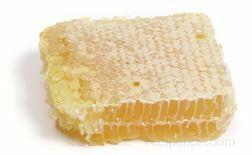 Rich and sweet in flavor, fresh honey taken directly from the comb is typically used as a food spread or an ingredient for baked goods and beverages.